For ethnic identities to disappear into one national identity, mechanical solidarity needs to be established. “The social molecules which can be coherent in this way can act together only in the measure that they have no actions of their own, as the molecules of inorganic bodies,” (Durkheim, 40). Mechanical solidarity prevents any sense of individuality. People in such a society are exact copies of each other; they do not have value on their own when they are a part of a mechanical solidarity . “The individual conscience, considered in this light, is a simple dependent upon the collective type and follows those of its owner. In societies where this type of solidarity is highly developed, the individual does not appear . . . . Individuality is something which the society possesses” (Durkheim, 40). People are like parts of a machine that fit together, and if one were to dissemble the machine’s parts, the part would not function because the part would have no life in and of itself. People derive their meaning from their mechanical solidarity. Mechanical solidarity needs to be established for nationalists to accomplish their goal of making national and ethnic identity the same. However, if the people of a society are united under organic solidarity instead of mechanical solidarity, nationalists are unable to achieve their goal. “This (organic) solidarity resembles that which we observe among the higher animals. Each organ, in effect, has its special physiognomy, its autonomy. And, moreover, the unity of the organism is as great as the individuation of the parts is more marked” (Durkheim, 40 & 41). In a society held together by organic solidarity, each person has value. Each has a personality. While different, each stays connected. Indeed, the more different each becomes, the more connected each is. Nationalists are not able to make the national identity and ethnic identity of people within a society one and the same. In Sarajevo there are instances of mixing mechanical solidarity and organic solidarity. There are times when people are part of the crowd, doing what everyone else is doing. Instances like this are known as mechanical solidarity. People blindly following a law or social norm experience this kind of solidarity. There are other times when people act as individuals and show their autonomous personalities. These people are connected to one another through organic solidarity. There is a paradoxical example of mechanical and organic solidarity occuring simultaneously in a short story titled “The Communist” in Miljenko Jergović’s Sarajevo Marlboro. 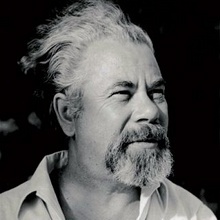 Ivo T. was a part of the Communist Party whose influence could be characterized as mechanical solidarity. However, he still acted as an individual with his family, meaning he was also influenced by organic solidarity. He did not mind doing things differently than others in the Communist Party. For example, Ivo T. and his family roasted lamb in front of his apartment. People who walked by gave them disapproving looks, but this did not bother Ivo. In this moment he was acting like an individual. There were also moments when he was part of the mechanical solidarity in Sarajevo. “Every day he came to work on his bike so that he wouldn’t stand out from the workers,” (Jergović , 90). This shows Ivo acting like a like part of the collective. However, he goes back to acting as an individual every Sunday. “On Sundays, however, he used to stick his wife and children in the Yugo 1300, and drive slowly up and down Princip Street or around Vitez so that everybody could see them,” (Jergović, 90). Ivo shows how mechanical solidarity and organic solidarity can happen simultaneously. 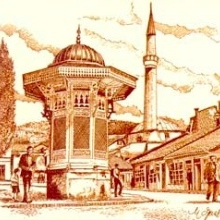 It shows that Durkheim was correct to say that, “Certainly, these two movements (mechanical and organic solidarity), contradictory as they appear, develop in parallel fashion,” (Durkheim, 38), and this truism is found in the social life of Sarajevo as dramatized in Jergović’s Sarajevo Marlboro. Durkheim, Emile. “On Mechanical and Organic Solidarity.” Social Theory: Roots and Branches. Ed. Peter Kivisto. New York: Oxford UP, 2011. 38-42. Print. 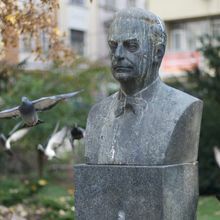 Jergović, Miljenko. a. Trans. Stela Tomašević. New York, NY: Archipelago, 2004. Print. Editor’s Note: The student essay was written in a course titled “Sarajevo: Surviving Urbicide” at Wittenberg University, Springfield, Ohio.